We've written about some pretty strange media over the course of the Artist Spotlight series, from smells to blood to self-referential machinery, but in this week's edition, we're going to look at a whole new order of material: life itself. Before you start to worry about the ethics of genetic manipulation or anything of that nature, relax: we're talking about slime molds. 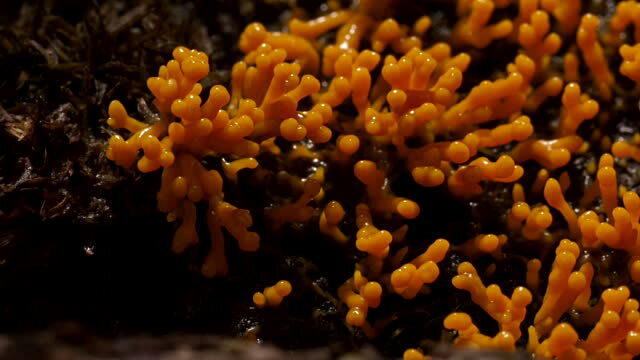 In case you've never heard of them before, slime molds are actually an extremely strange type of organism known as a supercell. Slime molds have no organs, no brains, nothing except the ability to replicate their simple cellular structures. They follow extremely simple rules, yet are capable of mapping entire areas of forest floors - or, as is the case more often lately, entire labs run by robotics systems analysts. They can evaluate their surroundings and make calculations about the best ways to move forwards - all without even the most rudimentary of brains. Some artistic purists may complain that her explorations of the interactions between art and science are a little too technical, but they are perhaps ignoring the true function of art: to make us reflect on what it means to be a thinking, conscious being in this crazy world we live in. Speaking to Wired magazine in an interview, she explained her primary working themes. "I'm interested in what we can learn from nature as individuals as organisations as a society. For me as an artist it is a fascinating subject matter. It's also my working material." Speaking about her latest project, which was on display earlier this year for a limited engagement, she said, "Broad Vision is an innovative interdisciplinary learning project, which puts the students in charge of their own research and allows them to explore new and stimulating interactions between art and science. The residency at arebyte gallery offers a fantastic opportunity for the students to share their experiences of interdisciplinary inquiry and showcase the results of their creative collaborations with public audiences." It's always fascinating to see the boundaries of what constitutes art being pushed. Rather than having clearly defined areas of perception in the world - this is science, this is art, this is technology, this is social psychology, etc - it's far more accurate to appreciate that all of these various elements interrelate in this glorious experience we call reality.